Every business needs a professional surveillance camera installation to protect their assets and workers. Working with the right installation experts is integral to maximizing the return on investment of your camera system. Our team can take you through every step of the process and ensure you will be happy with your business camera solution. You often get what you pay for, and installing cheap camera equipment isn't always cheap. If you don't know what you're doing, give us a call! Cleaning up after a failed installation is often significantly more expensive than if you had just contacted us in the first place. Cheaply made cameras often have high rates of defective products, and installs of 3rd party equipment is billed hourly. Time spent troubleshooting and removing defective cameras, and re-installing replacement cameras, can add up fast! Our installation for already purchased equipment starts at $125/camera, and we can work with all major manufacturers of security cameras. Please fill out our online form, or give us a call today at 800-440-1662 for more information about our nationwide camera installations. 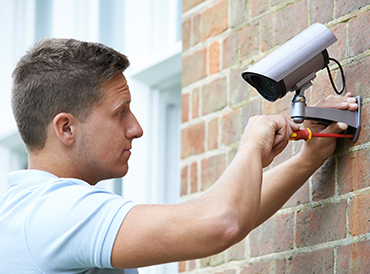 Having a trusted and professionally installed security camera system in your business is a must! Every business has valuable customers, employees, inventory, and equipment that needs to be protected with a business camera system. Today's Geovision security cameras boast improvements to performance and functionality, at a price that is the perfect fit for the everyday needs of business managers and owners. Advances such as missing object detection that will alert you when something that was in the field of view of the camera has been removed, and options to allow for notification. Alerts can also be sent on motion or facial reconigition. Camera Security Now sells top quality surveillance products. When you buy from us you only get the best. Customer service is the cornerstone of our business. When you purchase a system through Camera Security Now you get lifetime phone support.